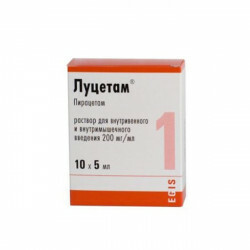 Lucetam - solution for intravenous and intramuscular administration: 1 ml contains Piracetam 200 mg; excipients: sodium acetate; glacial acetic acid; water for injections; in 5 or 15 ml ampoules; in a pack of cardboard 10 (5 ml) or 4 and 20 (15 ml) ampoules, respectively. Lucetam has a nootropic effect. Symptomatic treatment of psychoorganic syndrome, in particular in elderly patients suffering from decreased memory, concentration and general activity, dizziness, mood changes, behavior disorder, gait disturbances, as well as in patients with Alzheimer's disease and senile dementia of the Alzheimer's type. Treatment of the consequences of ischemic stroke, such as speech disorders, disorders of the emotional sphere, motor and mental activity. During the recovery period after injuries and intoxications of the brain. Treatment of vertigo and related balance disorders, with the exception of vertigo of mental origin. As part of a complex therapy of low learning in children, especially in the case of difficulty in acquiring specific reading, writing, and counting skills that cannot be explained by mental retardation, inadequate instruction, or a peculiarity of the family environment. For the treatment of cortical myoclonus as a mono-or complex therapy. Hypersensitivity to piracetam or a derivative of pyrrolidone, as well as to other components of Lucetam; hemorrhagic stroke; end-stage renal failure (Cl creatinine <20 ml / min); children's age up to 1 year. Studies on animals did not reveal a damaging effect on the embryo and the development of offspring, including in the postnatal period, as well as the course of pregnancy and childbirth. Studies in pregnant women have not been conducted. Piracetam penetrates the placental barrier and into breast milk. The concentration of the drug in newborns reaches 70-90% of its concentration in the blood of the mother. Except in special circumstances, lucetam should not be administered during pregnancy. You should refrain from breastfeeding when prescribing a woman Lucetam. From the nervous system and sensory organs: hyperkinesia (> 1%), irritability (> 1%), drowsiness (<1%), depression (<1%), asthenia (<1%), agitation, aggressive behavior, disorder sleep, dizziness, headache, increased sexuality, tremor. From the side of cardiovascular system and blood (hematopoiesis, hemostasis): arterial hypo-or hypertension, exacerbation of coronary insufficiency. On the part of the digestive tract: nausea, vomiting, diarrhea, abdominal pain. On the part of metabolism: an increase in body weight (> 1%). On the part of the skin: skin hypersensitivity reactions. 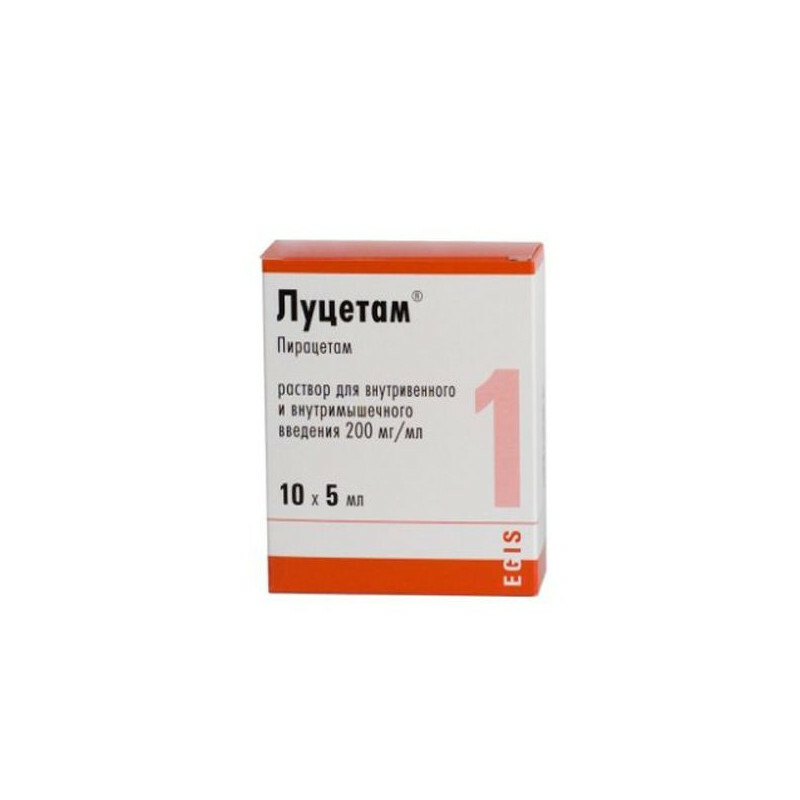 Lucetam is applied inside, in / in, in / m. The average daily dose of 30-320 mg / kg, the initial dose of 1.2-2.4 g / day, with acute violation of cerebral circulation, comatose state, withdrawal syndrome with alcoholism - 9-12 g / day; supporting - 1.2-4.8 g / day in 2-4 doses. The course of treatment is from 2-3 weeks to 2-6 months, the abolition is gradual. Children: 30-50 mg / kg / day, up to 5 years old - 0.6-0.8 g / day, 5-16 years old - 1.2-1.8 g / day, 8-13 years old (with reduced learning ) - up to 3.3 g / day. With cortical myoclonia, the initial dose is 7.2 g / day, increasing the dose by 4.8 g / day every 3-4 days to a maximum dose of 24 g per day; gradual cancellation. For sickle cell anemia: 160 mg / kg / day in 4 divided doses. In patients with renal insufficiency, a dose reduction is necessary: ​​with Cl creatinine 50-79 ml / min - up to 2/3 of the usual dose, 30-49 ml / min - 3 times, 20-29 ml / min - 6 times. In violation of liver function dose adjustment is not required. In a dry, dark place at a temperature of no higher than 25 ° C. Shelf life - 2 years.